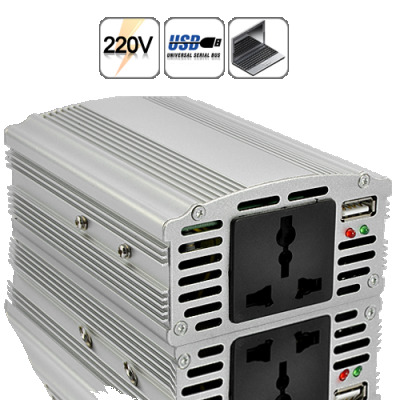 Successfully Added 350W Power Inverter (12V DC to 220V AC + 5V USB Port) to your Shopping Cart. This powerful and effective 350W power inverter brings you convenience by converting 12V DC power to 220V AC power and allows the use of domestic home appliances to be used outside, such as games consoles, CD players, portable DVD, home stereo equipment, TV, laptops and much more. Ideal for camping and caravans, it's power on the move! With it's 350 watt power output, this power inverter can easily handle most DIY tools without the need for long trailing cables when working away from the house. It's great on camping trips for powering up the TV, computers/laptops, home stereo equipment, light bulbs, etc. Also if you're often on the road, you can finally use your laptop in the car without worrying about running out of juice. Finally, the USB port provided allows you to easily charge your cell phone or other portable electronic devices on the go. 350W power is great for laptops, 20" TVs, home stereo, computers/printers/fax machines, halogen light bulbs, etc.